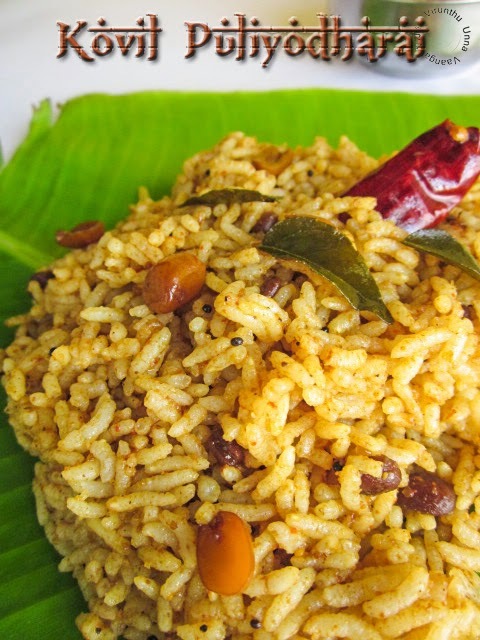 Hi friends, the days and times are running very fast… Last Friday I was very busy with my sis arrival, and now the week was gone… Today, I was busy with baking and now time to post the recipe for today; I prepared my most favorite variety rice which is none other than Puliodharai/Tamarind Rice/Kovil Puliodharai. Mostly, we used to get prasadams in temple whenever we visit. Markazhi month, full of festive month, my uncle is a mariyamman temple trustee in my town, the temple is very famous in Dindigul, one month festival will be celebrated in feb-march month of every year. So whenever they do pooja, my uncle brings prasadams to us and this is one of my favorite after sweet pongal. 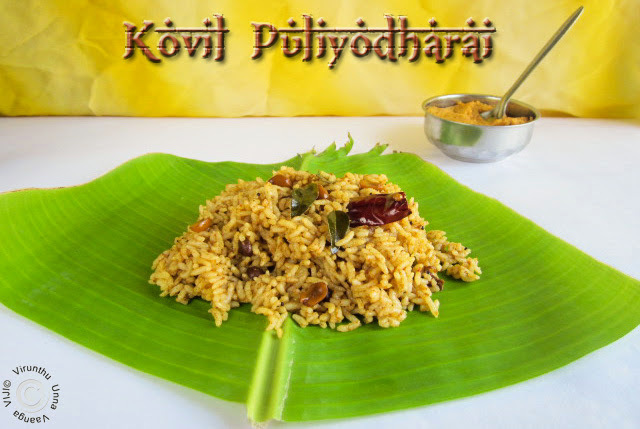 I saw the recipe of temple puliodharai in Aval Vikatan supplement book, which is special of kovil prasadam recipes. No further delay, I tried the recipe with paruppu thogayal. 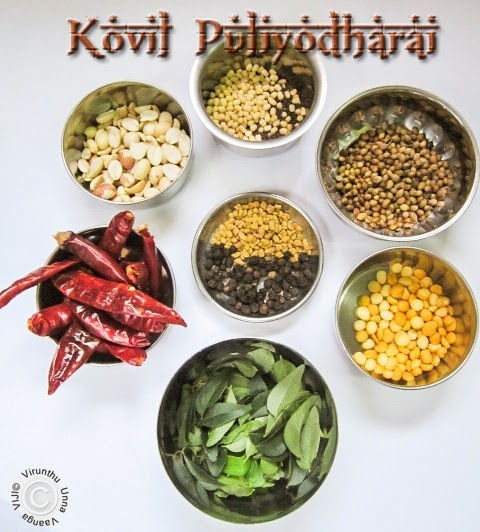 +Srivalli jetti from Cooking 4 all Seasons initiated the Cooking from Cookbook Challenge, so am sending the recipe to CC Challenge of the month. 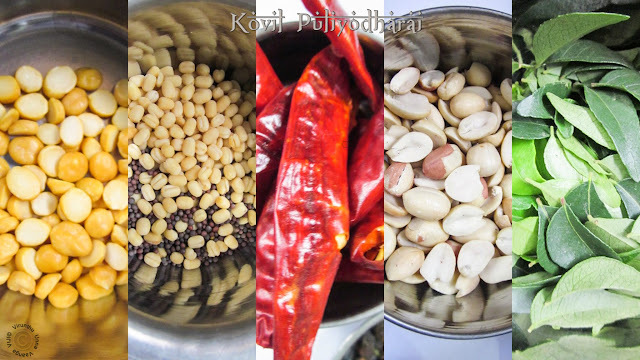 Coming to the recipe, the spice powder will give the unique taste to the puliodharai, and sesame oil is best and must for the recipe. The taste was exact like kovil puliodharai. Hereafter, I won't make other version, potato fry is best combo for the puliodharai and even you can store the spice powder for further use. 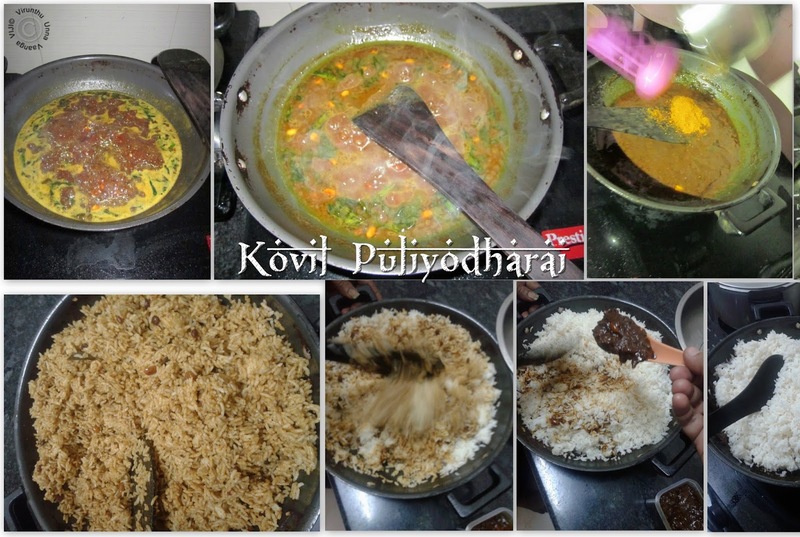 If you love kovil prasadham, give a try to the recipe, am bet you will love it lot. Cook the rice with 1 Tsp of oil and water. Add tamarind to 2 cups of water and take thick extract and set aside. Coriander seeds and dry red chillies till the aroma come and cool it completely and grind to powder in a blender and keep it aside. 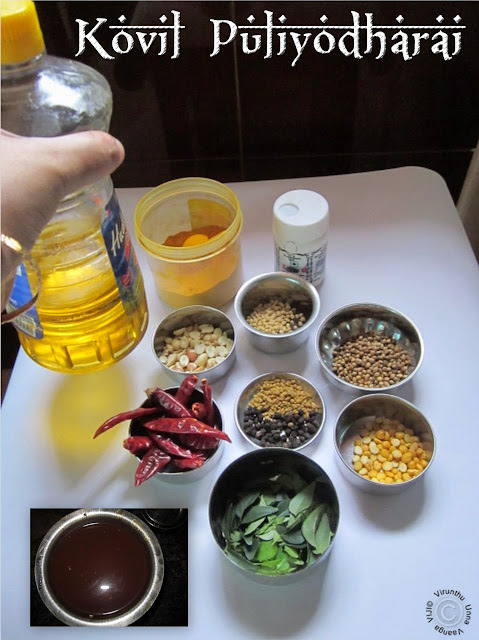 Heat sesame oil in a pan; add chana dal, mustard and urad dal seeds wait for sputter. Add peanuts, hing and curry leaves, when it starts golden brown add the tamarind extract to it. Add turmeric powder, salt and sugar stir it well and keep the flame on high till boiling. After boiling, keep the flame on low level and allow cooking till the oil oozes out and it starts to thicken. While thicken the mixture add ground powder and mix it well and allow cooking for 2-3 minutes or oil oozes out from it. Switch off the flame and puli kaichal is ready. Now add the mixture little by little to the cooked rice and mix it well. 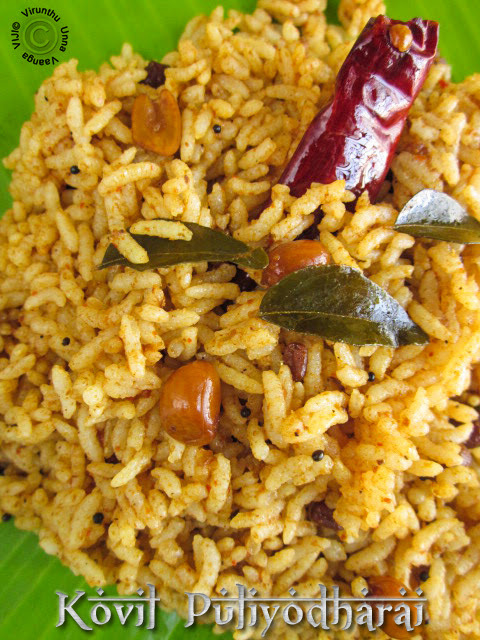 Serve it hot with Paruppu Thogayal and Potato roast. Sesame oil is must; don’t use any other cooking oil. 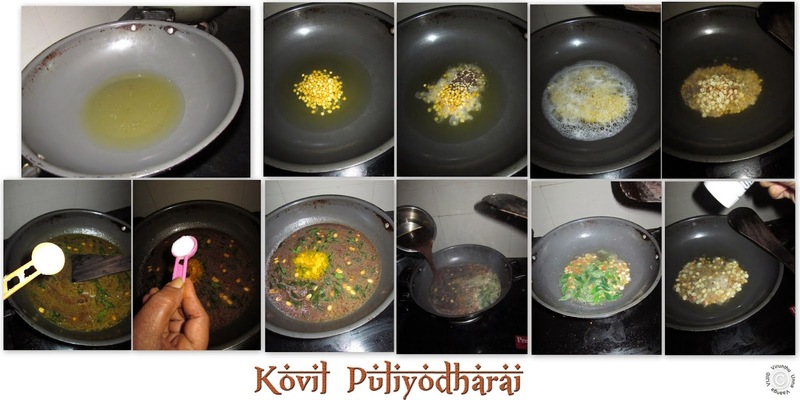 You can store the puli kaichal (gravy) in air-tight container in refrigeration up to two weeks. You can replace the sugar with jaggery piece or can avoid. You can store the spice powder too. 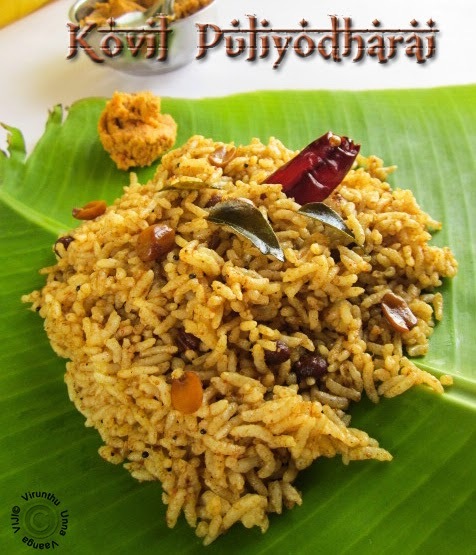 ENJOY THE DIVINE TASTE OF THE PULIYODHARAI!!! 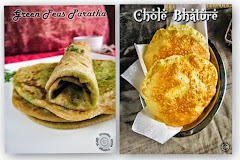 i love this.... we get this as prasadam in temples and they do taste divine.... lovely clicks. Lovely Puliodharai! 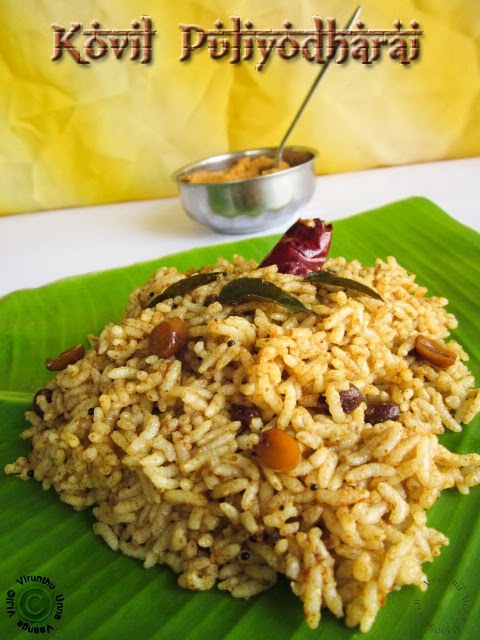 Shall try this combo soon..
My mouth is watering just looking at the recipe, its my fav dish and I love th temple version a lot. I love this recipe so much its my fav one temple verison is so good got to try this. 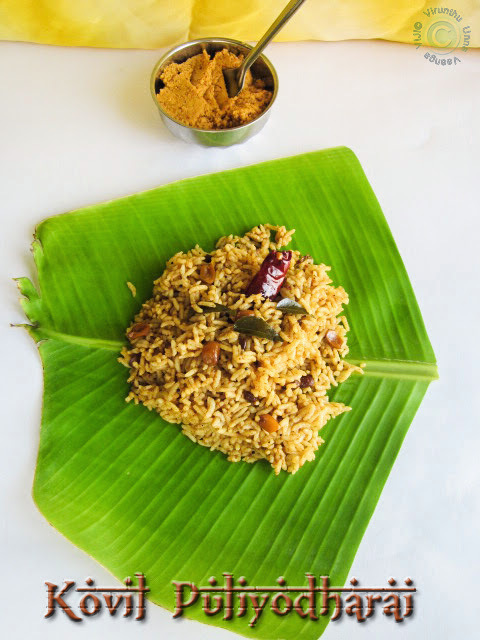 Tempting Clicks da Viji,super delicious Puliodharai. 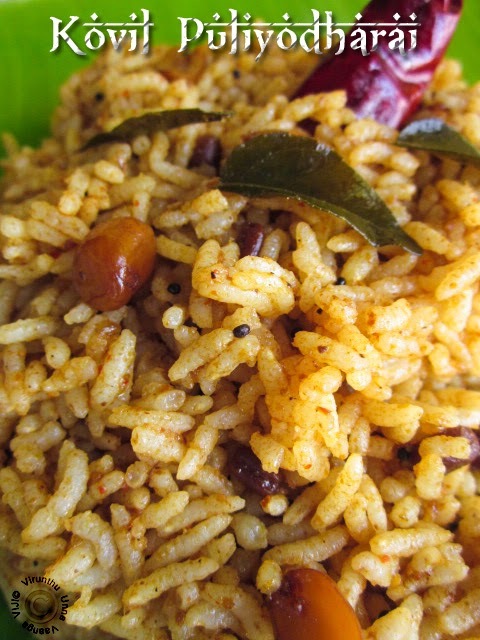 Kovil Prasadam def tastes divine/special esp when served in thonnai's :) Very aromatic & flavorful looking rice. 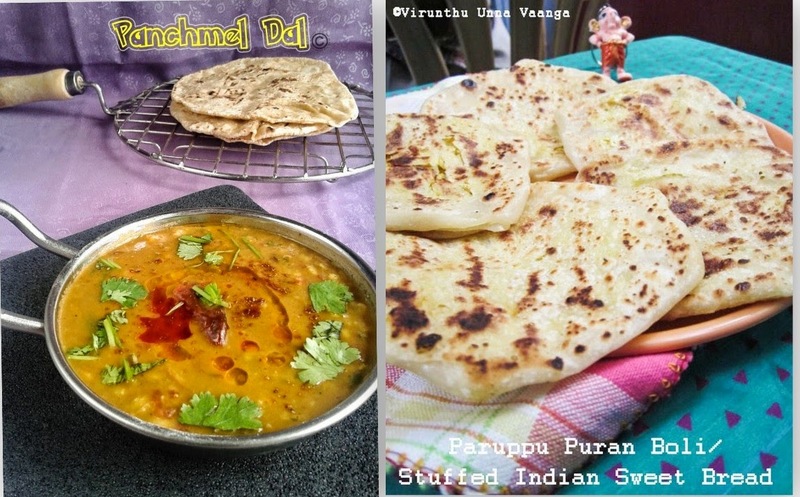 Def a must try recipe, Viji! I love pulihora and your is looking so inviting..very nice! Thank you so much for the recipe. 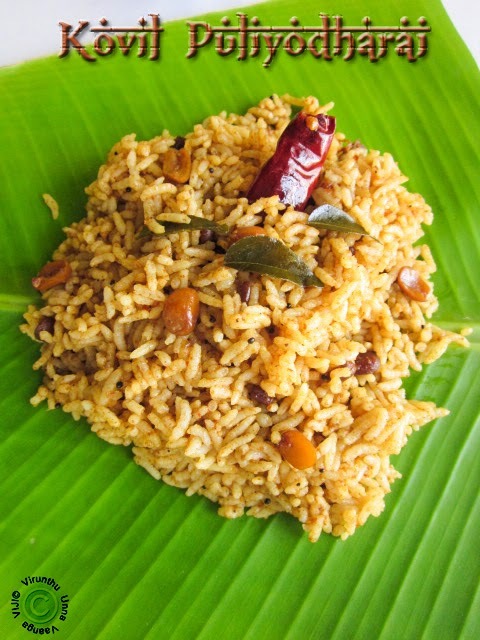 We love temple pulihora and always wonder why the taste of homemade one never matches that of the temple. Will be making this pretty soon.